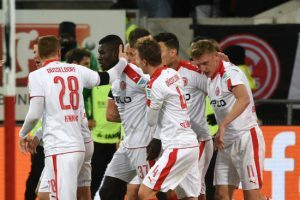 The bitter cold of Friday night was definitely worth braving as I witnessed a thrilling encounter between Fortuna Düsseldorf and Hannover 96. The Espirit Arena was the venue and around 29,000 passionate supporters joined me in freezing their feet off in Düsseldorf’s superb ground. With both sides aiming for promotion this year and both in a good position in the league to do so, this was a big game. The two had met weeks before in the DFB Cup, Hannover winning 6-1 on their own turf with a thoroughly dominate performance that saw them score four goals in the first sixteen minutes. Could Düsseldorf prove in this game that they’re much more capable than they demonstrated in their last meeting? Both sets of fans in full voice, the stadium set, the whistle sounded to signal the start of the game. The action came thick and fast. Hannover coming close from a corner early on and the home side also causing their guests a few difficulties. But it was Hannover in the 17th minute that struck first. A sweetly struck effort from Kenan Karaman after he cut in from the left before unleashing a cool finish into the far corner via the post. It was a wave of Hannover attacks that pursued the first goal of the game. The club from Niedersachsen frustrated as they failed to add a second before half time. Talented youngster, Noah-Joel Sarenren-Bazee of 96 hit the crossbar after getting himself into a one on one position which was then followed by a block off the line after Waldemar Anton shot from outside the area. Ihlas Bebou of Düsseldorf found himself one on one not too long after however his tame effort was easily saved by Phillip Tschauner. Just before the half time whistle sounded there was a chance for one more opportunity for the away side. A corner swung into the near post found Karaman whose glancing header was cleared off the line by Axel Bellinghausen. Fortuna were indeed fortuitous to make it to half time with only a one goal deficit. It didn’t take long for 96 to threaten their opposition’s goal in the second period. Karaman the man involved again. His shot from close range saw the ball drift agonisingly across goal before bouncing off the inside of the post and then back into the Düsseldorf goalkeeper’s hands. After this, you felt it wasn’t going to be Hannover’s day. And indeed it certainly looked that way when, in the 52nd minute, Bebou put the home side back on level terms. Bellinghausen pulling the ball back into the path of the Togolese striker who buried the ball into exactly the same corner as Karaman did in the first half. It took just nine minutes for Hannover to regain their lead however. Stefan Strandberg’s free kick forced a top save from Michael Rensing but it was parried straight into Felipe’s feet whose effort bounced into the ground and over the despairing goalkeeper. Six minutes later and the home side were level once again. Robin Bormuth passing the ball into an open goal after Bellinghausen’s left footed strike fizzed across goal, falling nicely to Bormuth. The scoreline at 2-2 was a frustration for Hannover and proved too frustrating for some. Felipe picked up a second yellow card and was dismissed. Now it was Düsseldorf’s turn to try and take the lead. But they failed to do so. In fact it was the side now playing with ten men that nearly won it when Anton’s first time shot forced Rensing to produce a good save. Nonetheless, the home side will be the happier of the two. Trailing and coming back to equalise twice. It will be a bittersweet result for Hannover. Knowing they could easily have been three or four goals up by half time. But not losing after going down to ten men must be seen as a positive for them. Fortuna Düsseldorf now sit in 6th, three points off automatic promotion while Hannover 96 find themselves in the playoff position one point behind VFB Stuttgart who play this Monday.